The 37-year-old striker is preparing for his second season in Major League Soccer with the LA Galaxy -- a suitably and literally Hollywood location for a footballer who perhaps personifies glitz and glamor like no other -- and the Swede told CNN Sport about the impact of the distinctive yellow vehicle on him while growing up. "I saw a lot of movies from America, and the first time I came to America, when I saw these yellow school buses, I was like, 'I'm in one of these movies,'" he confesses, "because I only saw it in the movies. "And when I got the opportunity, I took it immediately, because I saw it as a great chance for me, for my career and for the life outside the field." Never a truer word spoken, as so often seems to be the case with the enigmatic Swedish star. But while the legendary Zlatan has won almost every honor in the game -- it is perhaps easier to list the trophies he did not lift for his clubs, such as the Champions League and English Premier League -- he surely will not settle for another season of mediocrity in L.A., where missing out on the playoffs last time around must have stung. He does not disagree, especially when it is pointed out that he has famously declared that "the older I get, the better I get, like red wine." With a customary smirk, he responds, "So, imagine what will happen this season. "After one season in MLS, I know it more now, I know things better ... And I'm excited, I look forward just to start playing again ... because I like the MLS after playing one year there, and the first season was like what is waiting, what will happen, how is it, which level it is, and all these things. "But now I have everything in my head, so now I just go out on the field and I dominate." 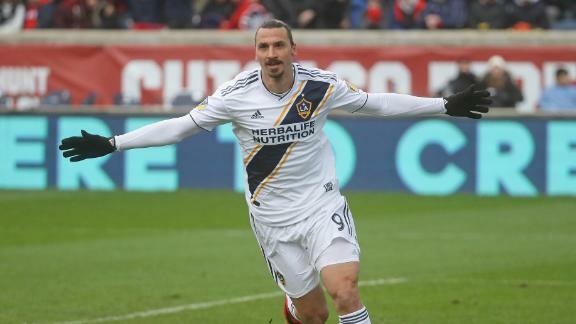 The final day of the 2018 season will not be finding room among Zlatan's greatest hits, with the Galaxy blowing a 2-0 halftime lead, ultimately losing 3-2 at home to the Houston Dynamo, thus denying the team a playoff spot. It was a far cry from the Swede's debut in Los Angeles in March 2018. If Wayne Rooney generated headlines in the US for "The Play," a ludicrous passage late in a game which culminated in an injury-time winner for D.C. United, then Zlatan made an immediate impact for "The Goal." Coming on as a substitute with 20 minutes to play in the L.A. derby against rivals LAFC -- a match understandably branded as "El Trafico" -- Zlatan galvanized his team, not just spearheading the recovery from 3-1 down to a 4-3 victory but scoring a simply staggering first goal with a vicious, dipping shot over the floundering goalkeeper's head from all of 40 yards. For good measure, he would go on to score the decisive goal in the seven-goal thriller. Even now, it's a debut that surely ranks with any other in his storied career. "I rank it very high, because it was a special moment," he begins, referring to his wonder strike. "After being out [for] one and a half years with a very bad injury, and people were wondering 'can he come back, can he play football?' I had a lot of questions, and I wanted a lot of answers, especially after the hard work I'd put down to really come back to that moment where I feel alive. "Scoring that goal was exactly the answer I wanted. I was alive ... I needed a moment like that. So, I really needed it to feel alive. So, at that moment I said, 'I have still to give. It's not over.'" While Zlatan seems at ease being one of the biggest stars in the league, one wonders whether he still craves some competition from those other footballing A-listers so famous we know them by their first name. Case in point: Cristiano. It did not go unnoticed that Ronaldo recently took umbrage with his great rival, Lionel Messi, for not attempting something different himself, such as joining CR7 in Italy's Serie A, whereby they could once again renew their rivalry. Yet Zlatan has posed the question, asking whether Ronaldo joining the most dominant side in Italy is such a leap of faith either. Would he like the Portuguese megastar to play in America? "To have the MLS growing, to get the boost it needs, you need to get those players obviously," he states. "And then for him, he has to know what's a challenge for him. Only he knows that, I cannot talk for him what a challenge is." The Swede is happier, however, to talk about the importance of his tattoos. These are not mere decoration on his body but incredibly significant and give a snapshot into the intensity he puts into every aspect of his life. "I have so many tattoos, so I don't know even if I remember all of them, but I think every tattoo means a lot to me, or else, I would not have them," he starts. "Every tattoo has its own story, and if I would have more, I like to have tattoos where I don't see them. "That's why they're all on the back, because I don't see them. In front, I would not like it. And I don't have any more place behind, so let's see, you never know. When the adrenaline kicks in, and you want to get something done, then it's the time I do it." In other words, Ibrahimovic is continuing to make his mark.